Bright rich colors, will have your product noticed first! Combine that with full body coverage that molds to any shape this type of label will have your product noticed first. Another benefit of Shrink Sleeve Labels is that they are very durable and can withstand some of the harshest packing, transporting and shelving conditions so that your brand stays true from production to consumer. 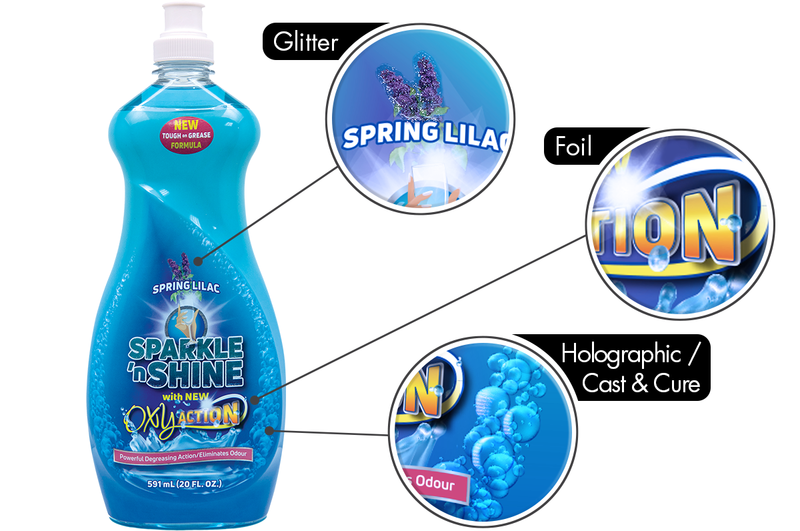 think4D introduces surface decorations to shrink sleeves, “Go ahead and bling-it up with glitter, foil, cast and cure…” we’ve got you covered for all the latest special effects. Our expertise in distortion will keep the message and graphics consistent throughout the process. Our staff commitment to quality and customer service will not be matched in the industry. When is comes to equipment we test and qualify any new equipment to ensure top quality and reliability — Revolutionary technology in shrink sleeve manufacturing!